You are buying the Forma Full Face Mask Headgear Fisher & Paykel 400HC315, manufactured by Fisher & Paykel. Fisher & Paykel is a leading manufacturer of CPAP Headgear and accessories. At ADW Diabetes, we offer the complete line of Fisher & Paykel CPAP products with excellent pricing and fast shipping. You are buying the Forma Full Face Mask Headgear Fisher and Paykel 400HC315, manufactured by Fisher and Paykel. Fisher and Paykel is a leading manufacturer of CPAP Headgear and accessories. At ADW Diabetes, we offer the complete line of Fisher and Paykel CPAP products with excellent pricing and fast shipping. 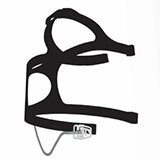 Forma CPAP Mask incorporates a two-part cushion assembly like those found on the popular FlexiFit 405 and Flexifit 432 masks. The auto adjusting inner FlexiFoam Cushion helps contour the mask to a wide range of faces and promotes optimal frame alignment. The outer silicone seal is frosted to provide a leak resistant surface with a soft, smooth feel against the skin. Advanced Air Diffuser - This maintenance free diffuser system prevents air from blowing onto your sleeping partner and decreases noise that could disrupt your sleep.